Several parenting forums, non-existent loan companies and UV-protected sunglass vendors have used PM Modi’s image to sell their products on Facebook, according to the ad library report. What do pregnancy forums, baby care apps, dodgy loan companies and sellers of UV-protected sunglasses have in common – they have all been flagged by Facebook for advertising their products on the social media platform using Prime Minister Narendra Modi’s image. 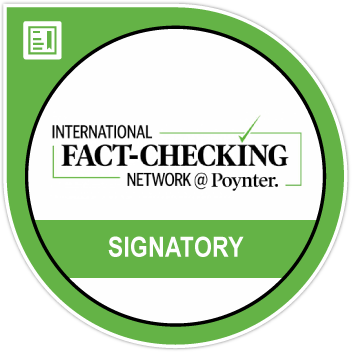 BOOM’s investigation into Facebook’s ad library report reveals that the social media giant has been taking down ads by several non-political pages due to the lack of a required disclaimer that provides the identity of the advertiser, after the sponsored posts were identified as ‘political’ or ‘issues of national importance’. 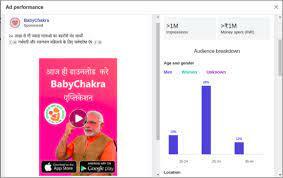 The Facebook page called BabyChakra, which serves as a pregnancy and parenting platform, had spent above Rs. 6 lakh to sponsor a single post that was eventually taken down by Facebook on the grounds of a ‘political’ ad being run without the required disclaimer. The post had used Modi’s image in a 50-second commercial, leading to Facebook identifying the post as political or of national importance. BOOM reached out to BabyChakra for a comment but was unable to get a reply. The article will be updated if and when they respond. BOOM also found two parenting apps called ‘Pregnancy and Baby Care App’ and ‘Healofy: Smart Pregnancy and Baby Care App’, that have used Modi’s image in their sponsored posts. 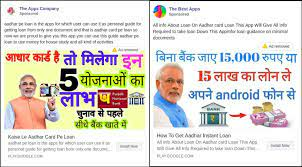 Meanwhile, two dubious Facebook pages called ‘The Apps Company’ and ‘The Best Apps’ ran several ads in the month of February, promoting posts related to non-existent loan schemes, and using Modi’s image to garner impressions on the social media platform. The posts claimed to show users how to get loans of up to Rs. 15 lakh with an Aadhaar card without going to a bank. Up on clicking on each of the links, the user is redirected to a non-existent Google Play link, leading us to believe these pages are scams. What we found especially surprising is that both the pages had sponsored these posts for approximately Rs. 2.5 lakh, put together, in the month of February, despite each of them having less than 100 followers. The ad library report also revealed that these posts have made considerable impressions while they were active, before Facebook took them down for either the lack of the required disclaimer for political ads or for flouting Facebook’s advertising policies, or both. BOOM reached out to Facebook to ascertain the time taken for the platform to flag such sponsored posts and take them down. The article will be updated if and when they respond. The ad library report also listed a few pages intended for employment seekers and another dubious page called ‘PUGB Wala Chashma’, which have used Modi’s image to sell their products. 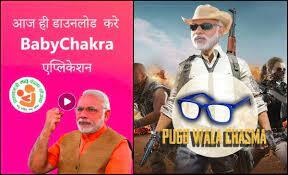 Up on clicking on the links to the posts by the ‘PUGB Wala Chashma’ page, we were redirected to an online market called Scroll Street, selling UV-protected sunglasses, which had no link to either PUBG or the prime minister. According to the Emblem and Names (Prevention of improper use) Act of 1950, companies are prohibited from using the prime minister’s name or image for commercial purposes. The aforementioned pages have, however, flouted the prohibition by using social media to commercialise their products – something which has been hidden from the public up until Facebook improved the transparency around political ads by giving access to the ad library. BOOM also observed that since Facebook has made the political ad library available for Indian public, the number of sponsored posts using political imagery for commercial purposes have dropped considerably.